After weeks of speculation, anticipation and a dose of hype, Apple is widely expected to announce a new smartphone at an event in San Francisco on Wednesday. Apple isn’t saying anything about the topic of the event, but the email invitation it sent to reporters contains a shadow in the shape of a “5” — a nod to the iPhone 5. It is being held in San Francisco at Yerba Buena Center for the Arts Theater, where Apple has held many product launches. The new model is expected to work with fourth-generation, or 4G, cellular networks. That capability is something Samsung’s Galaxy S III and many other iPhone rivals already have. A bigger iPhone screen is also possible. The new model will likely go on sale in a week or two. Apple Inc. also plans to update its phone software this fall and will ditch Google Inc.’s mapping service for its own, as a rivalry between the two companies intensifies. In a related development, Google said Tuesday that it is releasing a new YouTube app for the iPhone and the iPad. The changes come amid the expiration of a five-year licensing agreement that had established YouTube as one of the built-in applications in Apple’s mobile devices. Still unknown is whether Apple will announce a smaller version of its iPad on Wednesday. Apple dominates the market for tablet computers, shipping seven out of every 10 tablets worldwide in the second quarter, according to research firm IHS iSuppli. Rivals have been trying to compete by producing smaller, cheaper models —such as Amazon’s Kindle Fire. A mini iPad would challenge those relative newcomers. Sales of Apple’s iPhones are still strong, though the company lost the lead in smartphones to Samsung this year. Samsung Electronics Co. benefited from having its Galaxy S III out in the U.S. in June, while Apple was still selling an iPhone model it released last October. A new iPhone will allow Apple to recapture the attention and the revenue. Amid expectations of a new iPhone, Amazon, Nokia and Motorola all tried to generate interest in their products last week, hoping that a head start on the buzz will translate into stronger sales. Makers of consumer electronics are refreshing their products for the holiday shopping season. Amazon announced four new Kindle Fire models and a new line of stand-alone e-readers, while Nokia and Motorola unveiled five new smartphones between them. Nokia and Microsoft, in particular, are trying to generate interest in a new Windows operating system out next month. The two phones announced by Nokia are among the first to run Windows Phone 8. 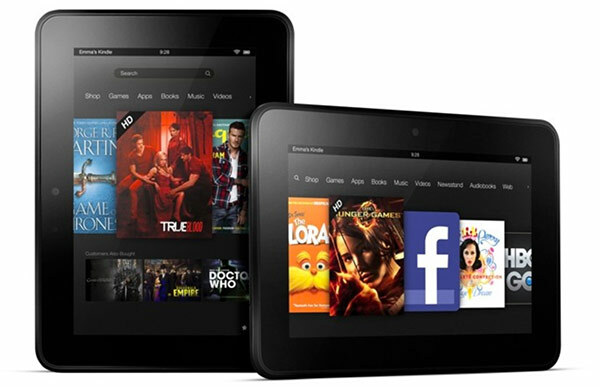 Amazon is also releasing higher-end models under the Kindle Fire HD line. A 7-inch one will go for $199, while an 8.9-inch one will go for $299. There’s also a $499 model that can use the 4G cellular networks that phone companies have been building. A data plan will cost an extra $50 a year. The smaller HD model will start shipping Friday, while the larger ones will be available Nov. 20. Amazon also refreshed its line of stand-alone e-readers, offering the Paperwhite, with its own light source. Tablets such as the iPad and the Fire don’t work as well in bright light because they are lit from the back. Amazon says the light on the Paperwhite is directed down at the display. Barnes and Noble Inc., which makes the 7-inch Nook Tablet, may have an update this fall as well. Toys R Us, meanwhile, said Monday that it is making a 7-inch tablet aimed at children. The Tabeo will go on sale Oct. 21 for $149.99. Though it’s a pioneer in the cellphone industry, Motorola hasn’t had a hit since the Razr phone came out in 2004. Under new owner Google Inc., Motorola Mobility is trying to change that. Last week, Motorola announced three new smartphones bearing the Razr name. The $99 Droid Razr M will be in Verizon Wireless stores this Thursday, the day after Apple’s announcement. Motorola will have two high-end models, the Razr HD and Razr Maxx HD, later this year. It’s emphasizing long battery life — up to 21 hours of talk time for the Maxx HD, or 10 hours of video streaming. These are the first major products from Motorola since Google bought the company for $12.4 billion in May. Google, meanwhile, continues to sell a 7-inch Android tablet, the Nexus 7, made in partnership with AsusTek Computer Inc.
Microsoft Corp. will release a new version of the Windows operating system on Oct. 26, one that’s designed to work on both traditional computers and tablet devices. A new version of the Windows Phone system is coming out, too. Once-dominant phone maker Nokia Corp. has been struggling in the shadow of Apple and Android, and it’s counting on the new Windows system for a revival. Last week, Nokia and Microsoft unveiled two new devices under Nokia’s Lumia brand — the 820 and the 920. Nokia CEO Stephen Elop says the new phones will go on sale in the fourth quarter in “select markets.” He didn’t say what they would cost or which U.S. carriers would have them. Investors were disappointed, and Nokia’s stock fell 16 percent on the day of the announcement. Samsung, which surpassed Nokia as the world’s largest maker of mobile phones in 2011 and overtook Apple in smartphones this year, showed off a Windows 8 phone late last month. It didn’t announce an availability date either. Microsoft plans its own tablet computer, too. It’s new territory for Microsoft, which typically leaves it to others to make devices using its software. Now, it will be competing against its partners. The Surface tablet will come in two versions, both with 10.6-inch screens, slightly larger than the iPad’s. One model will run on phone-style chips, just like the iPad, and will be sold for a similar price. A heavier, more expensive version will run on Intel chips and be capable of running standard Windows applications. The Surface will go on sale on Oct. 26. A year ago Research In Motion Ltd. disclosed that it was working on a next-generation phone system for the BlackBerry, which now looks ancient next to the iPhone and Android devices. It was supposed to be out in time for this year’s holiday season. That won’t happen. In June RIM pushed the release of BlackBerry 10 devices into early next year, saying it wasn’t ready. That means RIM will not only compete with the new iPhone and Android devices out this fall, but it will also have to contend with the new Windows devices.